Kple Kple mask, Baule Tribe, Ivory Coast. 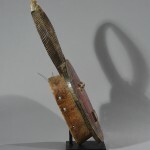 This very fine Kple Kple mask of the Baule Tribe derived from Kondeyaokro village in Côte d’Ivoire. 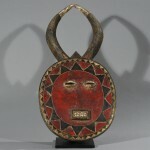 It is one of the most popular and distinguishable designs of African masks in the African masking tradition. It is both greatly appreciated by Western art enthusiasts and has had a great influence on Western artists for more than a century. 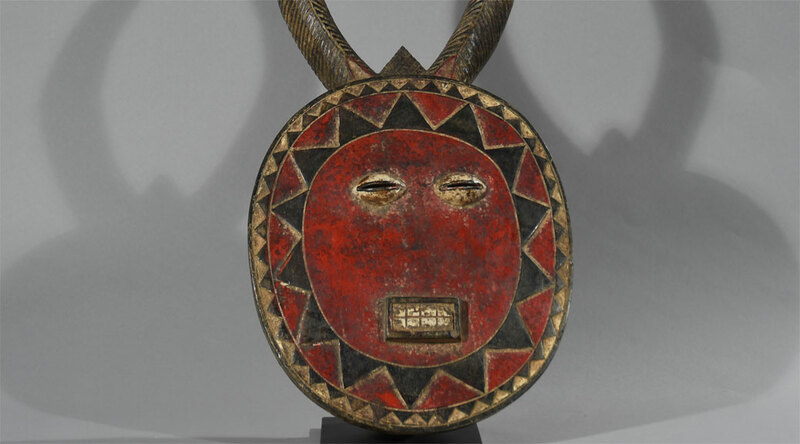 The common features of the Kple kple mask are flat, round disc shaped faces with geometric features, bulged eyes and the rough warning teeth and antelope shaped horns. The essence of this piece is a refererence to the sun, and the sunbeams are represented by polychromed triangles on its borders. The red face is considered female, whereas the dark/black face is considered male. The Kple kple is considered the lowest of Goli masquerades and these rituals appears 3 times during the day: dawn, afternoon and after sunset. The dance announces the arrival of Goli Glin a zoomorphic figure or of kpwan, an anthropomorphic one. 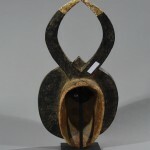 This type of mask is usually used in commemorative, agricultural and burial ceremonies or during times of danger. 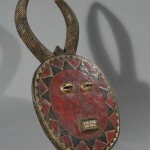 The mask would generally be worn with a raffia (grass) costume attached to the lower section of the mask reaching to below the waist and are often draped in goatskin that covers their back.The mask wearer mediates with supernatural forces during the ritual, which have a positive influence on the village people. The Baule tribe adopted this ritual from the neighboring Wan tribe, even the language of the Wan is still used during the ritual. The colors (achieved through a combination of paint and pigment) are brilliant and this carving is very expressive. Age: Est. beg. to mid-20th Century. Condition: In spite of age and heavy use, the condition is good. Very few scratches. An almost invisible repair of an apparently broken horn. Provenience: Private Belgian collection and acquired from a Brussels gallery. Literature: McIntyre, L. Lee and Christopher D. Ray. 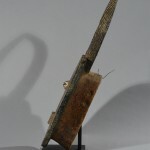 “Art and Life in Africa Online”. 1998 and Cf. Barbier (1993: 126, figure 212) for a related Goli mask.